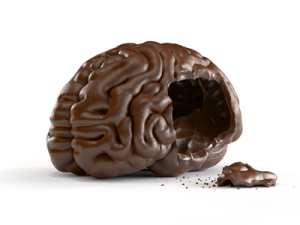 Dark Chocolate: Good For Your Brain! Dark chocolate is beneficial to your brain health and wellness. Induldge! The fact is for over 20 years, I’ve been toting the benefits of dark chocolate to my patients with a brain injury, such as someone with a concussion, stroke, MS, Parkinson Disease, Autism and ADHD. I’ve even included this information in my newest book, Coping with Concussion and Mild TraumaticBrain Injury. Luckily, it seems that this notion of dark chocolate and chocolate chips organic being healthy is becoming more widely known, and recently there was even a segment on the evening news discussing recent research on how eating dark chocolate was good for memory, especially for seniors. On Medscape in 2013, Dr. Bret S. Stetka, MD wrote about the 7 Health benefits of Chocolate. In this article, he noted that cocoa is high in flavanols. “These abundant phenolic plant compounds have markedantioxidant and anti-inflammatory properties and are thought to be responsible for much of the health benefit ascribed to chocolate consumption.” For a reference point, the darker the chocolate, the more flavanols. In previous blogs, I’ve emphasized that a brain injury, especially a concussion, causes the brain to become inflamed. Therefore, I always recommend an anti-inflammatory diet for anyone who has recently suffered a concussion, and dark chocolate is certainly included in this diet because of its beneficial anti-inflammatory properties. Dr. Steka’s article also states that flavanols can help reduce blood pressure. Having high blood pressure, of course, is very unhealthy, and can even lead to stroke. In the article, Dr, Steka discusses a 2011 study of the Swedish Mammography Cohort, published in the Journal of the American College of Cardiology, which found an inverse relationship between cocoa-rich chocolate consumption in women and stroke: Increasing chocolate consumption by 50 g per week reduced cerebral infarction risk by 12%, hemorrhagic stroke risk by 27%, and total stroke risk by 14%. A more recent study looking at a cohort of over 37,000 Swedish men, published in Neurology, reported that individuals who eat at least 1.8 oz of chocolate per week have a 17% lower risk for stroke compared with those who eat less than 0.4 oz per week. In other recent research, it is shown that the amount of flavanol, which dark chocolate is rich in, was the key factor in helping seniors to reduce memory loss. Other articles state that flavanol also help in regulating your mood and even depression. So, the bottom line here is that eating dark chocolate is good for your memory, blood pressure, and your mood. It helps alleviate depression and also acts as an anti-inflammatory, which means that it is good for your brain. And if it is good for your brain…it is good for you. Also, please remember that if you have had a brain injury, it is essential to cut out as much sugar from your diet as possible. Sugar is terrible for your brain in general, and detrimental to a brain that is healing from an injury. This is why it is vital to look for chocolate that is at least 85% cocoa. For more information, please see Martha Lindsay’s blog- Ditch the Sugar and Say bye to Brain Fog. Healthy Holiday Treat – Chocolate! One of my favorite memories was when I was in Switzerland and went to a chocolate factory. At the factory there was a fountain of chocolate where you could put a cup or piece of biscuit in the fountain to gather the warm chocolate. It was delicious. Another time when I was in Belgium at another chocolate factory, they had a similar fountain, but it was made of dark chocolate. I believe that just thinking of it these events is making my brain better! Please, if you have a concussion, stroke or other brain injury or you don’t want brain fog, you can still enjoy chocolate during the holiday season…Halloween, Thanksgiving and Christmas…just make sure it is dark chocolate that you’re consuming. So, are you still looking for a perfect present? Think about chocolate gift basket. It is tasty and useful for your health!